Countries that use the US dollar. Countries that call their currency "dollar". Countries that formerly used a currency called "dollar". అ.సం.రా. రెండు డాలర్ల బిల్లు. సాధారణ చెలామణీలో లేదు, కానీ అధికారికమైనదే. డాలర్ లేదా డాలరు (Dollar) పెసో మరియు డాలర్ చిహ్నం $ తో సాధారణంగా దర్శనమిస్తుంది. ఒక మారక ద్రవ్య విలువ పేరు. సాధారణంగా ఆస్ట్రేలియన్ డాలరు, బెలీజ్ డాలరు, బ్రూనై డాలరు, కెనడియన్ డాలరు, హాంకాంగ్ డాలరు, నమీబియన్ డాలరు, న్యూజీలాండ్ డాలరు, సింగపూర్ డాలరు, న్యూతైవానియన్ డాలరు, అ.సం.రా. డాలరు, మరియు పూర్వపు జింబాబ్వియన్ డాలరు రూపాలలో కానవస్తుంది. యూ.ఎస్. డాలరు, తూర్పు తైమూర్ , ఈక్వెడార్, ఎల్ సాల్వెడార్, మైక్రోనేషియా , పలావు మరియు పనామా దేశాల యొక్క అధికారిక ద్రవ్యం. సాధారణంగా, ఒక డాలరులో వంద సెంట్లు వుంటాయి. 15 జనవరి 1520, బొహీమియా రాజు వెండి నాణెముల ముద్రణను ప్రాంతీయంగా ప్రారంభించాడు, ఈప్రాంతం పేరు జోచింస్‌థాల్. ఇక్కడ ముద్రితమైన నాణేలను "జోచిమ్‌స్థాలర్" అని పిలిచేవారు, రాను రాను వీటి పేరు థాలర్ లేరా తాలర్ గా మార్పు చెందినది. ఇతర భాషలలోనూ డాలర్ అనే పదం కానవస్తుంది : జెక్ టోలర్, హంగేరియన్ టాల్లేర్, డేనిష్ మరియు నార్వేజియన్ (రిగ్స్) డాలేర్ , స్వీడిష్ (రిక్స్) డాలేర్, Icelandic dalur, Dutch (rijks)daalder or daler, Ethiopian ታላሪ ("talari"), Italian tallero, Flemish daelder, Polish Talar, Persian Dare, as well as - via Dutch - into English as dollar. A later Dutch coin depicting a lion was called the leeuwendaler or leeuwendaalder, literally 'lion daler'. The en:Dutch Republic produced these coins to accommodate its booming international trade. The leeuwendaler circulated throughout the en:Middle East and was imitated in several German and Italian cities. This coin was also popular in the Dutch East Indies and in the Dutch New Netherland Colony (New York). It was in circulation throughout the Thirteen Colonies during the 17th and early 18th centuries and was popularly known as lion (or lyon) dollar. The modern American-English pronunciation of dollar is still remarkably close to the 17th century Dutch pronunciation of daler. Some well-worn examples circulating in the Colonies were known as "dog dollars". Spanish pesos - having the same weight and shape - came to be known as Spanish dollars. By the mid-18th century, the lion dollar had been replaced by Spanish dollar, the famous "piece of eight", which were distributed widely in the Spanish colonies in the New World and in the Philippines. The sign is first attested in business correspondence in the 1770s as a scribal abbreviation "ps", referring to the Spanish American peso, that is, the "Spanish dollar" as it was known in British North America. These late eighteenth- and early nineteenth-century manuscripts show that the s gradually came to be written over the p developing a close equivalent to the "$" mark, and this new symbol was retained to refer to the American dollar as well, once this currency was adopted in 1785 by the United States. By the American Revolution, Spanish dollars gained significance because they backed paper money authorized by the individual colonies and the Continental Congress. Common in the Thirteen Colonies, Spanish dollars were even legal tender in one colony, Virginia. On April 2, 1792, U.S. Secretary of the Treasury Alexander Hamilton reported to Congress the precise amount of silver found in Spanish milled dollar coins in common use in the States. As a result, the United States dollar was defined as a unit of pure silver weighing 371 4/16th grains (24.057 grams), or 416 grains of standard silver (standard silver being defined as 1,485 parts fine silver to 179 parts alloy). It was specified that the "money of account" of the United States should be expressed in those same "dollars" or parts thereof. Additionally, all lesser-denomination coins were defined as percentages of the dollar coin, such that a half-dollar was to contain half as much silver as a dollar, quarter-dollars would contain one-fourth as much, and so on. Various acts have subsequently been passed affecting the amount and type of metal in U.S. coins, so that today there is no legal definition of the term "dollar" to be found in U.S. statute. Currently the closest thing to a definition is found in United States Code Title 31, Section 5116, paragraph b, subsection 2: "The Secretary [of the Treasury] shall sell silver under conditions the Secretary considers appropriate for at least $1.292929292 a fine troy ounce." There are many quotes in the plays of William Shakespeare referring to dollars as money. Coins known as "Thistle dollars" were in use in Scotland during the 16th and 17th century, and use of the English word, and perhaps even the use of the coin, may have begun at the University of St Andrews. [ఆధారం కోరబడింది] This might be supported by a reference to the sum of "ten thousand dollars" in Macbeth (Act I, Scene II) (an anachronism because the real Macbeth, upon whom the play was based, lived in the 11th century). In 1804, a British five-shilling piece, or crown, was sometimes called "dollar". It was an overstruck Spanish 8 real coin (the famous 'piece of eight'), the original of which was known as a Spanish dollar. Large numbers of these 8-real coins were captured during the Napoleonic Wars, hence their re-use by the Bank of England. They remained in use until 1811. During World War II, when the U.S. dollar was (approximately) valued at 5 shillings, the half crown (2s 6d) became nicknamed a "half dollar" by US personnel in the UK. Chinese demand for silver in the 19th and early 20th centuries led several countries, notably the United Kingdom, United States and Japan, to mint trade dollars, which were often of slightly different weights from comparable domestic coinage. Silver dollars reaching China (whether Spanish, Trade, or other) were often stamped with Chinese characters known as "chop marks", which indicated that that particular coin had been assayed by a well-known merchant and determined genuine. A New Zealand one-dollar coin. 500 old Zimbabwean dollar bill of the first Zimbabwean dollar. 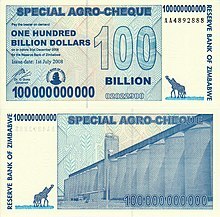 100 billion dollar bill from Zimbabwe. Prior to 1873, the silver dollar circulated in many parts of the world, with a value in relation to the British gold sovereign of roughly $1 = 4s 2d (21p approx). As a result of the decision of the German Empire to stop minting silver thaler coins in 1871, in the wake of the Franco-Prussian war, the worldwide price of silver began to fall. This resulted in the US Coinage Act (1873) which put the United States on to a 'de facto' gold standard. Canada and Newfoundland were already on the gold standard, and the result was that the value of the dollar in North America increased in relation to silver dollars being used elsewhere, particularly Latin America and the Far East. By 1900, value of silver dollars had fallen to 50 percent of gold dollars. Following abandonment of the gold standard by Canada in 1931, the Canadian dollar began to drift away from parity with the U.S. dollar. It returned to parity a few times, but since the end of the Bretton Woods system of fixed exchange rates that was agreed in 1944, the Canadian dollar has been floating against the US dollar. The silver dollars of Latin America and South East Asia began to diverge from each other as well during the course of the 20th century. The Straits dollar adopted a gold exchange standard in 1906 after it had been forced to rise in value against other silver dollars in the region. Hence, by 1935, when China and Hong Kong came off the silver standard, the Straits dollar was worth 2s 4d (11.5p approx) sterling, whereas the Hong Kong dollar was worth only 1s 3d sterling (6p approx). మలేషియా: the en:Malaysian ringgit used to be called the "Malaysian Dollar". The surrounding territories (that is, Malaya, British North Borneo, Sarawak, Brunei, and Singapore) used several varieties of dollars (for example, en:Straits dollar, en:Malayan dollar, en:Sarawak dollar, en:British North Borneo dollar; Malaya and British Borneo dollar) before Malaysia, Singapore and Brunei gained their independence from the United Kingdom. See also for a complete list of currencies. Spain: the en:Spanish dollar is closely related to the dollars and euros used today. Rhodesia: the en:Rhodesian dollar replaced the Rhodesian pound in 1970 and it was used until Zimbabwe came into being in 1980. Zimbabwe: once used the en:Zimbabwe dollar, but abolished it and now use the en:South African rand, the US dollar, the Euro, the Pound sterling and the Botswana pula. Lua error in package.lua at line 80: module 'Module:Portal/images/n' not found. డాలర్, క్లాక్‌మాన్నంషైర్ స్కాట్లాండు లో ఒక పట్టణం. ↑ 6.0 6.1 Julian, R.W. (2007). "All About the Dollar". Numismatist: 41. ↑ Cross, Bill (2012). Dollar Default: How the Federal Reserve and the Government Betrayed Your Trust. pp. 17–18. ISBN 9781475261080. ↑ National Geographic. June 2002. p. 1. Ask Us. ↑ Florian Cajori (1993). A History of Mathematical Notations (Vol. 2), 15-29. ↑ Arthur S. Aiton and Benjamin W. Wheeler (May 1931). "The First American Mint", The Hispanic American Historical Review 11(2), 198 and note 2 on 198. ↑ Nussbaum, Arthur (1957). A History of the Dollar. New York: Columbia University Press. p. 56. ↑ Bureau of Engraving and Printing. "'What is the origin of the $ sign?' in FAQ Library". Retrieved December 14, 2010. ↑ Act of April 2, A.D. 1792 of the Senate and House of Representatives of the United States of America in Congress assembled, Section 9. ↑ Section 13 of the Act. ↑ United States Statutes at Large. ↑ Yeoman, RS. A Guide Book of United States Coins. ↑ Ewart, James E. Money — Ye shall have honest weights and measures. ↑ Herbert Appold Grueber. Handbook of the Coins of Great Britain and Ireland in the British Museum. ↑ "What is the value of an 1804 British Dollar". Wiki.answers.com. 2010-01-12. Retrieved 2012-03-25. ↑ "Monetary Madhouse, Charles Savoie, 2005". Silver-investor.com. Retrieved 2012-03-25. ↑ Alongside Zimbabwean dollar (suspended indefinitely from 12 April 2009), Euro, en:Pound sterling, en:South African rand and en:Botswana pula. The US Dollar has been adopted as the official currency for all government transactions. ↑ Wojtanik, Andrew (2005). Afghanistan to Zimbabwe. Washington, DC: National Geographic Society. p. 147. ↑ Although called Panamanian balboas, US dollars circulate as official currency, since there are no Balboa bills, only coins that are the same size, weight and value as their US counterparts. Etymonline (word history) for "buck" and Etymonline (word history) for "dollar"
ఈ పేజీలో చివరి మార్పు 5 జూన్ 2014న 23:22కు జరిగింది.